To those of you who may have noticed my recent blog silence and wondered about it, the truth is that I have been quite sick. A bacterial infection has flattened me and made it impossible for me to do much of anything, including blogging. I hope to be feeling better soon and back to my normal activities. Meantime, thank you for your patience. Bumblebee on Mexican firebush (Hamelia patens). Bumblebees are one of the few members of the insect world that most people actually like. They are a major contingent of the community of pollinators that inhabit my garden, and I find them to be good neighbors. I've worked in and around bees for many years and I've never been stung. Queen and worker bumblebees do have stingers and the capacity to sting, but they are very reluctant to use them. I find that if you leave them alone, they will leave you alone. Bumblebees are large, hairy insects with a lazy buzz and a clumsy-looking, bumbling flight. Most of them, at least in our area, are black and yellow. They are members of the genus Bombus in the familyApidae. They are social insects that are found mainly in northern temperate regions. There are a few that are native to South America and some that are naturalized in New Zealand. They can range much farther north than honeybees, because they are able to regulate their body temperature. In fact, there are colonies that can be found on Ellesmere Island in northern Canada where it gets quite cold. There have been schemes to introduce bumblebees to other parts of the world where they are not native, but usually such schemes turn out to have unintended consequences (Think about the House Sparrow in North America.) and are not a good idea. Busy bumblebee on a salvia blossom. Bumblebees start fresh with a new colony each spring. A queen that had mated the previous year is the mother of the colony. She first produces worker bees that are all female. Eventually, she produces drones (males) and, finally, new queens. At the end of the colony's life, only the new queens survive to start things off again next year. The bumblebee colony is much smaller than that of the honeybee. A mature colony may contain only 50 individuals. There is a quote attributed to Albert Einstein, which actually seems to be apocryphal, that said that without bees to pollinate our food crops, humans would die out within four years. The quote may be apocryphal but the information is probably not far off the mark. If bees died out, it seems certain that life as we know it would cease to exist within a short period of time. There would be much less to eat and it is possible that the human race could die out. At the very least, it is likely that it would be greatly reduced in number. Bees of all kinds are in trouble today, primarily because of the overuse and misuse of chemical pesticides, loss of habitat, and the effects of global warming. The status of the bumblebee is more secure than the honeybee, but it, too suffers from these maladies. I make sure that no chemical pesticides are used in my garden and that there are plenty of flowers there to provide pollen and nectar. The adults feed on nectar. They use pollen to nourish their young. Bumblebees are fascinating critters that make the backyard more interesting. If you are lucky enough to have them in your yard, I hope you will treasure them as I treasure mine. The flight of the bumblebee. Welcome to my October garden which is continuing its slow decline into winter. Of course, winters here are not much to write home about usually. 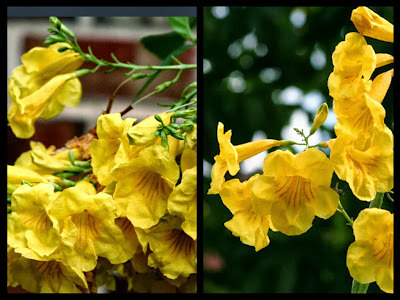 Even so, comparatively mild though it may be, it's a time of rest and refreshment for the garden and, to some extent, for the gardener as well. An event to look forward to. There are still plenty of blooms in the garden this month, but very few that are new. The goldenrod is just beginning to bloom. 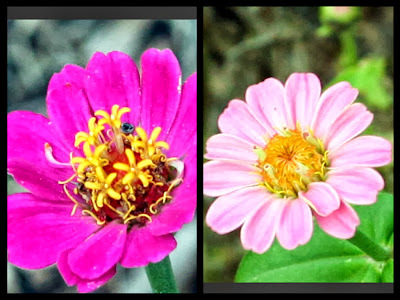 The fall asters have not done very well, but they are giving me a few blossoms. Autumn just wouldn't be autumn without a pot of chrysanthemums blooming by the front door. Other than these October additions, my blooms are pretty much the same old same old. Shrimp plant and 'Mystic Spires' salvia bloom together. After a long hiatus, the bush marigold is beginning to bloom again. A few zinnias are still blooming. The spring-blooming crossvine puts out a few autumn blossoms, too. I didn't notice the little anole on the left until I uploaded the picture. 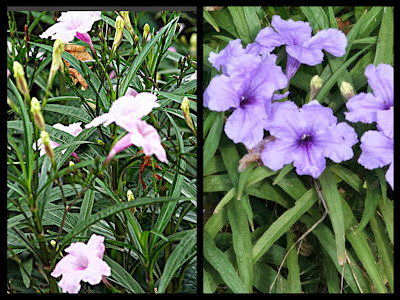 Ruellia: 'Chi Chi' (left) and 'Katie' (right). Summer-blooming wax begonia extending its bloom into autumn. 'Bleeding Heart' clerodendrum that hasn't quite started "bleeding" yet. So, there you have it - my oldies but goodies edition for October Bloom Day. Don't forget to visit our hostess Carol at May Dreams Gardens for a list of all the bloggers participating in this month's Bloom Day. Happy Bloom Day and happy gardening!